Colorado River floodplain with the uncharacteristically misty Chocolate Mountains in the distance. Another visit to Arizona is winding down, and again it seems like there is something here that wants to frustrate it. The family-visit part was good; it is the hiking-and-birding parts that always go off the tracks. In 2010, a ranger-guided hike to the Bétatakin Ruin (you can't go on your own) at Navajo National Monument was aborted when another hiker injured herself, stopping the trip for everyone. Last Tuesday, we drove our rented car into Kofa National Wildlife Refuge (named for the King of Arizona mine), bumped along some miles of gravel road, and finally found a pullout to park in. All ready to go hiking, I glanced at the left rear tire. It was flat. The next ugly surprise was in the trunk. Of course there was no full-size spare tire, but Hyundai does not even give you a short-range "donut" spare. Instead, they provide a canister of tire sealant that attaches to a 12-volt electric air pump, complete with warning not to drive the repaired tire more than 10 km. or six miles. Right. There's a tire shop just down the hill, past the big saguaro. So I pumped up the bad tire and, keeping it to 15–20 mph, drove carefully down to U.S. 95 (more than six miles), then dialed the car rental company's roadside-assistance number. I got through to a human being on the third try, and he was trying to locate us by triangulating my cell phone or something, because "Highway 95 north of Yuma, milepost ••" was too simple for him. And then to wait, as a military blimp hovered overhead, a drone buzzed in the distance, and artillery thumped. Yes, we were now by the Army's Yuma Proving Ground, where "in a typical year, over 500,000 artillery, mortar and missile rounds are fired, 36,000 parachute drops take place, 200,000 miles (320,000 km) are driven on military vehicles, and over 4000 air sorties are flown." When the tow truck showed up, about two hours after the original incident, the driver said that he had been given a location ten miles way, but he knew to call us himself. By the time we had obtained a new car, it was tequila time. Re-equipped with a Ford Focus, M., my sister, and I went to Imperial National Wildlife Refuge on Wednesday. This riparian refuge along the Colorado River is mainly about birds, with interior roads, overlooks, and hiking trails. Did I mention that it was raining? Yes, in the area that get about three inches a year, it was raining. We ducked into the visitor center, where upon hearing M.'s question about a hummingbird seen outside,the staffer on duty immediately had his Sibley guide open to the hummer pages. It cleared off enough for us to walk a couple of miles, although the skeeters was fierce. And then we relocated to the Rio Loco Bar on the river at nearby Martinez Lake, where we could check out a few birds through the plate glass windows behind the bar. We decided that that was a pretty nice place, so much so that we drove back out there after supper — because I had left my Sibley bird guide lying on the bar that afternoon. One other question. 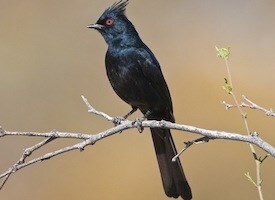 The Phainopepla has no common name? Really? ?